This classic recipe for Cornbread Dressing hits all the right marks. It's pretty perfect in every way. This dish is described as "deliciously moist and perfectly seasoned" on the myrecipes.com website, which are the perfect words. 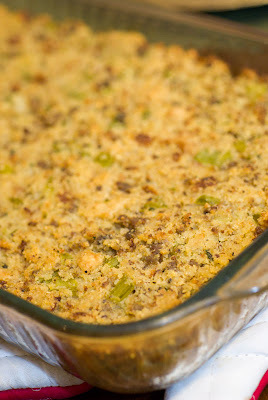 Of course, Cornbread Dressing from scratch takes a little more time and effort to make, but in my experience it is well worth it...especially at Thanksgiving! Brad looks forward to this dressing all year long! The biggest change that I made to the recipe below is the addition of mild sausage. I simply cooked a package of mild country sausage and added it to the vegetable mixture, before mixing everything together. I took elements from my Mom's Cornbread Dressing recipe and combined them with this recipe from Southern Living. I always put this dressing together the night before Thanksgiving and chill it in the refrigerator overnight (without baking). That way, all you have to do is pop it in the oven and cook it for about 35 - 40 minutes on Thanksgiving day! Place 1/2 cup butter in a 13- x 9-inch pan; heat in oven at 425° for 4 minutes. Combine cornmeal and next 5 ingredients; whisk in 3 eggs and buttermilk. Pour hot butter into batter, stirring until blended. Pour batter into pan. Bake at 425° for 30 minutes or until golden brown. Cool. Crumble cornbread into a large bowl; set aside. Melt remaining 1/2 cup butter in a large skillet over medium heat; add onions and celery, and saute until tender. Stir in sage, and saute 1 more minute. Stir vegetables, sausage, remaining 4 eggs, chicken broth, sourdough bread pieces, cracker pieces, and pepper into cornbread mixture (There are no better tools than your hands to properly mix the dressing at this stage! ); pour evenly into 2 lightly greased 13- x 9-inch baking dishes. Cover and chill 8 hours. Bake, uncovered, at 375° for 35 to 40 minutes or until golden brown. *1 tablespoon dried rubbed sage may be substituted for fresh sage. Andouille Sausage, Apple, and Pecan Dressing: Brown 3/4 pound diced andouille sausage in a skillet over medium heat; drain. Add sausage; 2 Granny Smith apples, chopped; and 2 cups chopped toasted pecans to dressing. Proceed as directed, baking 40 to 45 minutes or until done.